There are over 60 dark sky parks, preserves, and communities across the United States. The night sky in Joshua Tree National Park. Light pollution is a continuous reality for many cities around the world. The use of artificial lighting during the night has led to disruptions in the nocturnal environment. These disruptions cause problems for plants, animals, and even humans by interfering with the natural night-day cycle. With rising awareness on the importance of a dark sky in the night, astronauts and national organizations have created areas away from interference by artificial light called dark sky parks. These areas exist in categories such as communities, reserves, preserves, and sanctuaries. Dark sky parks help astronomers in studying the night skies and for stargazers who wish to enjoy the night skies. There are over 60 dark sky parks, communities, and reserves in the United States located in various states as designated by the International Dark-Sky Association. Dark Sky Reserve was designated in December 2017 as the first dark sky reserve in the US. The reserve, which is located in central Idaho, occupies an area of about 1,400 square miles. The reserve boasts as the third largest dark sky reserve in the world. The Chaco Culture National Historical Park was listed in 1987 as a UNESCO World Heritage Site. It is found in the county of McKinley, New Mexico. In 2010 it was designated as an International Dark-Sky Park. The park has an area of about 13,750 hectares and attracts about 39,175 visitors. The management of the park has initiated vigorous preservation efforts against light pollution including the initiation of the Chaco Night Sky Program. Canyonlands National Park is a dark sky park located in Utah. The park occupies an area of 527 square miles. Designated in 2015, the park attracts thousands of visitors who wish to enjoy an unpolluted night sky. The park’s management has established conservation measures such as the use of night-sky friendly lights in the night. Dripping Springs is a dark sky community formed by the residents of Dripping Springs City in Texas. The dark sky community was designated in February 2014 and occupies an area of 117 square miles. Residents of the city are subject to the Outdoor Lighting Ordinance, which helps in protecting the night-sky of the city. Located in California, the Death Valley National Park is a popular destination for stargazing. The national park is endowed with one of the darkest skies in the country. The park was listed as a dark-sky park in 2013 following efforts to protect the night sky from light pollution by the bordering Las Vegas. 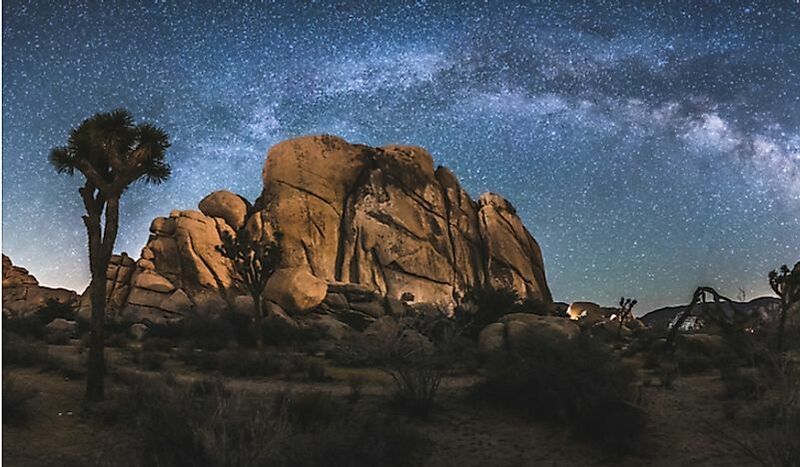 International Dark-Sky Association (IDA), the National Parks Service, and several other organizations around the US have initiated efforts to conserve the night-skies from the rising use of artificial lighting. Some of these efforts include mass education on the dangers of light pollution on wildlife and human beings, promotion of nighttime recreation activities such as stargazing and nighttime photography. IDA designates dark-sky areas by processing applications and selecting those that meet the set criteria including meeting the Borte Scale requirements. The Borte scale is a numerical scale which runs from 1 to 9. Other dark-sky parks in the world include Beaver Hills and Fundy National Park in Canada, Westhavelland Nature Park in Germany, Kerry International Dark-Sky Reserve in Ireland, Albanyà in Spain, Warrumbungle National Park in Australia, Iriomote-Ishigaki National Park in Japan, and NamibRand Nature Reserve in Namibia among many others.